The Health Department of Northwest Michigan formed Dental Clinics North, a shared dental initiative, in 1999 for the six local health departments that make up the Northern Michigan Public Health Alliance. The goal of the cross-jurisdictional sharing (CJS) arrangement was to stabilize the delivery of oral health services to low-income people. By 2004, the size of their initiative had increased to ten clinics and Thomas J. Veryser, DDS, MHSA, was hired to run the program. 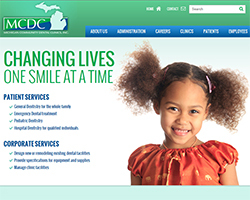 In 2006, Northwest founded Michigan Community Dental Clinics, Inc. (MCDC), a not-for-profit management services corporation, with leadership from Dr. Veryser. Through MCDC, the successful Dental Clinics North model for delivery of public health dental services now covers the entire state and employs over 60 full- and part-time dentists at 22 dental clinics organized into three regions. In 2012, they served over 70,000 patients with a primary focus on adults and children on Medicaid, as well as low-income, uninsured individuals. On May 28, 2014, the Center and the Northern Michigan CJS demonstration site hosted a webinar focused on how this dental services partnership works in their state. Linda Yaroch, RN, MPH, Health Officer at the Health Department of Northwest Michigan, provided information about the initial Dental Clinics North sharing arrangement. Dr. Veryser followed-up with information on how the Dental Clinics North model evolved into MCDC. He explained that the keys to MCDC’s success are a focus on maximizing efficiency, productivity and quality improvement. MCDC utilizes many centralized services, like electronic patient records, billing services and appointment scheduling. MCDC does not own the clinics it operates or the equipment that is in them. Instead, municipalities create clinics through their health departments. The clinics are often partially or fully funded through private donations. MCDC leases the clinics from the health departments at the health departments’ monthly costs. To schedule services, patients call a centralized contact center and are assigned to a specific clinic. By having one contact center serve the entire state, patients receive a consistent message, which helps them avoid misunderstandings. Central administration collects fees and pays bills. All of this allows the clinics’ staff to focus on serving patients. An electronic system allows MCDC to effectively monitor the daily cost of each clinic. They use that information to establish daily production goals for each clinic, which equal the cost of operating that clinic on that day. Staff at the clinics know the daily goal and receive a bonus every day they achieve it. This incentive program boosts productivity. Dentists and hygienists are compensated at a flat daily rate plus a percentage of the work they provide. They control their own schedules and work at their own pace, but are motivated by the pay structure to be productive. The result is that they are usually paid at or above market rates. They also receive a competitive benefits package. To get consistently high quality outcomes and high patient satisfaction from all clinics, MCDC has standardized clinic processes and procedures where possible. Clinics have a “no-show” rate of less than nine percent system-wide, which is very low compared to public health as a whole. They accomplish this by educating patients about their responsibility to keep appointments. The contact center first informs patients about this responsibility and others, then the front desk reinforces the message to the patients. The contact center also helps patients get to their appointments on time by giving them directions or other helpful information. When dollars are generated at a clinic in excess of cost, they are put into a dental excess fund which supports clinics that do not cover costs and also helps pay for care for uninsured patients.